I remember visiting optometric practices around 30 years ago when I was still a student. Some seemed so dated, which wasn’t saying much since back in those days there really wasn’t much technology to be had. There were some doctors who did not have slit lamps and used Burton lamps to fit contact lenses. I even visited an ophthalmologist whose staff refracted with a trial lens set instead of a phoropter. I was one of the first Lenscrafters doctors in the St Louis area. This was when US Shoe owned the company instead of Luxottica. 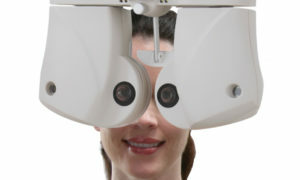 Lenscrafters wanted to wow patients with the newest technology. It worked. Patients would comment on how modern our technology was compared to other doctors they had visited in the past. At that time autorefractors were new. We had an automative tangent screen. Those flashing lights and clickers impressed the patients when the tangent screen decided to work. Later this was replaced with a Humphrey field analyzer. We also received an autokeratometer and fundus camera. I opened my own practice around 15 years later. However, I used the same basic equipment that I had at Lenscrafters minus the camera and field analyzer. I made do with a tangent screen. Money was tight starting a practice cold, so I had to prioritize what equipment was absolutely necessary. In the 11 years that I had my practice I only added a Zeiss Visual Field analyzer. I knew there was more modern technology available to me. Continuing education seminars would introduce me to corneal topography and OCT. This technology I understood but did not think necessary for my fledgling practice. More recent seminars talked about machines and tests that I did not understand. I was beginning to feel like a dinosaur. My concern was that I was so far behind the times that maybe I should not be practicing anymore. Recently I did an equipment survey online where I realized that I did not recognize at least half of the items. All of a sudden I had become the old clueless doctor whose practice was dated. Eventually I did retire. Recently I went to my old office for an eye exam. I was so impressed with the new technology. All of my antiquated pre-testing equipment was gone. My lane was still there with a new vision analyzer instead of the projection lamp. Instead of direct ophthalmoscopy the doctor used a fundus lens with the biomicroscope to examine my retina. My word of advice is not to become complacent. Keep up with the latest and greatest technology. My big mistake was staying in the 1980s and not joining the 21st century with the rest of you. What is your attitude toward new instrumentation? Are you sometimes intimidated, or do you usually look forward to making it a part of your practice?